Spring has most definitely arrived here in the UK as temperatures soared this week to 25oC here in London. It has certainly given me that Summer vibe and has made me even more excited about my vacation this year. Although we don’t actually go until September, it’s never too early to start planning and picking up bargains in Primark. As you know, if you see something cute instore and in your size, you HAVE to buy it there and then otherwise it is most likely that it will sell out. Trust me! The key for shopping in Primark is to go super early, when the store has literally just opened for business. That way you will have around an hour of browsing without the hassle of others getting in your way, garments and hangers strewn across the floor or burying your way through a mountain of unfolded garments on the tables. It’s super easy to locate your size and the queue isn’t huge! So here’s the beauts that I managed to pick up. 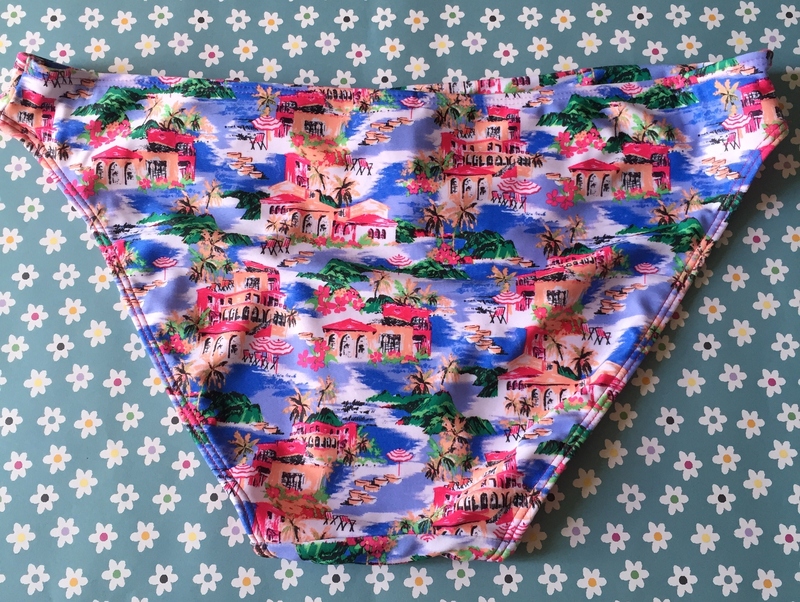 Last year I bought a few of these and they are the perfect bikini cover up. They’re super cheap and they look amazing on. 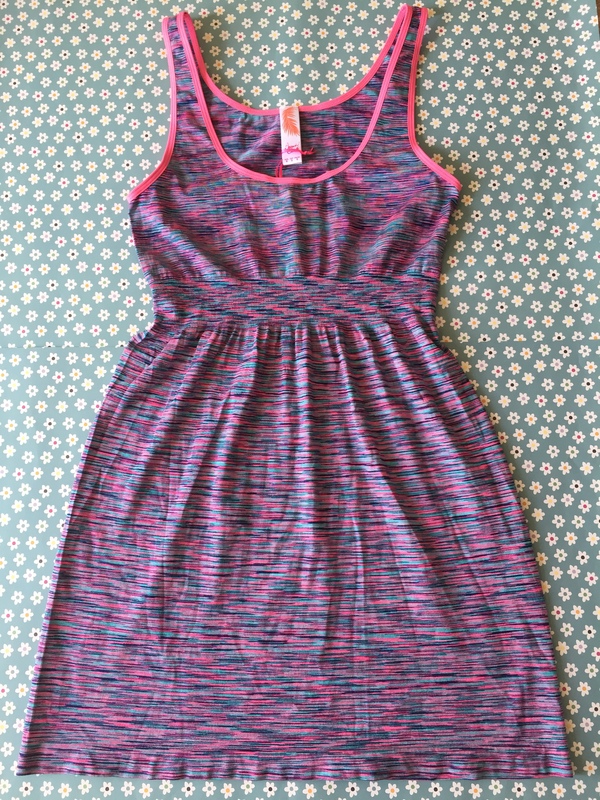 This one has two pockets at the front and a draw string waist. The top is elastic which means it won’t slip down. The material is a lightweight polyester which is excellent if you are somewhere very hot. Also, this material dries very quickly should you get it wet at the pool or beach. I absolutely love the colours!! 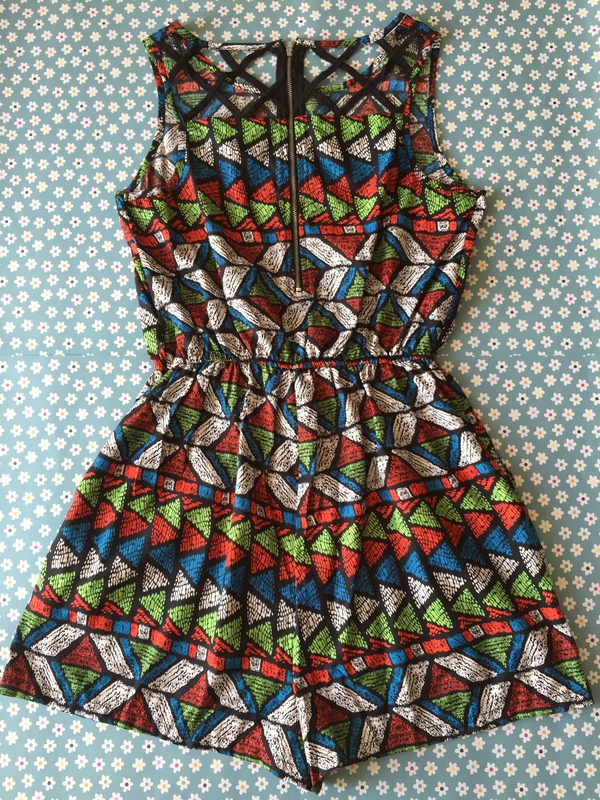 A similar material to the one above, however this playsuit features a lattice design and zip on the back which I think is very cute. It just adds a little extra oomph to the design. Again it has two front pockets and a draw string waist. 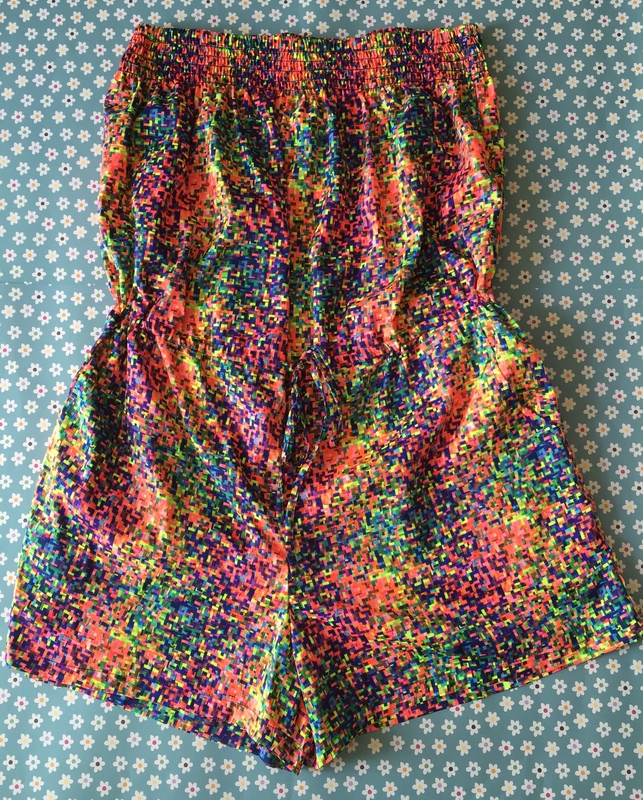 It sits very nicely and the shorts are not too short. I think I’ll team this one up with a pair of gold sandals which will compliment the colours. Love love love!! This is a another perfect bikini cover up. 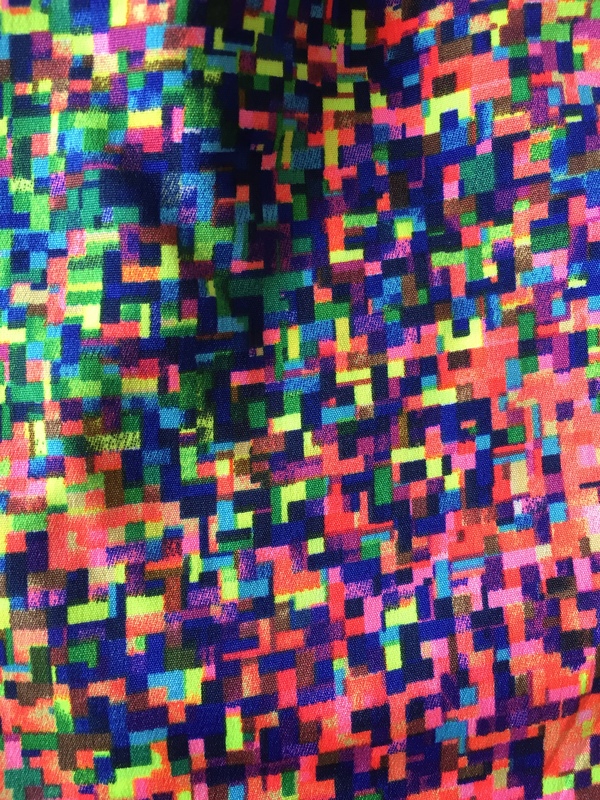 The fabric is part polyester part elastane. It is super soft, stretchy and is a bit like t shirt material. The waist has extra elastic which cinches in giving a great shape to the dress and not just blocky like a smock. 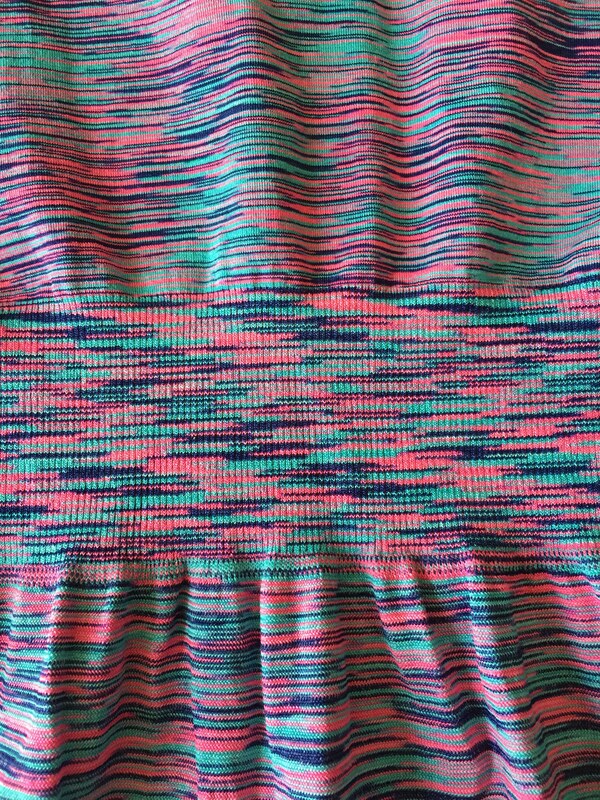 The fluro piping makes this dress stand out more. The colours are my favourite combination. 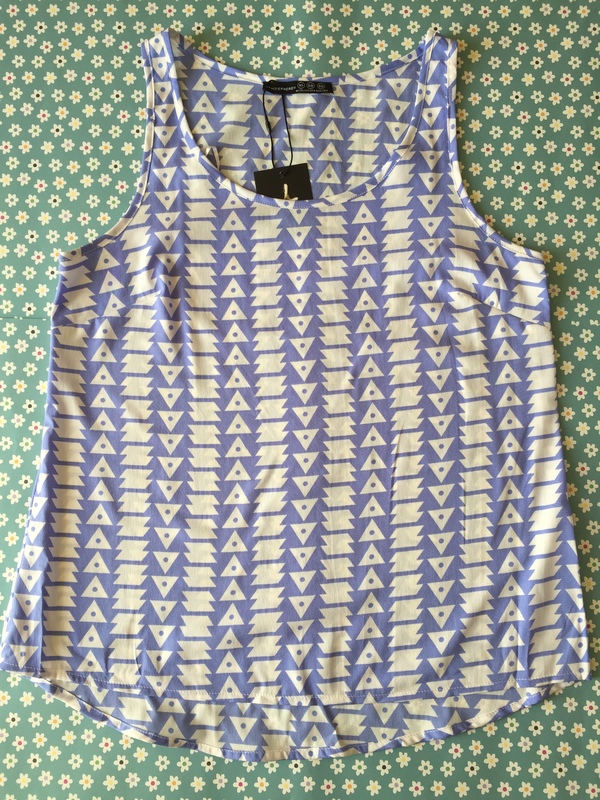 These vests seem to reinvent themselves with different designs every Spring/Summer. I have loads of these but they are so versatile and great value for money. 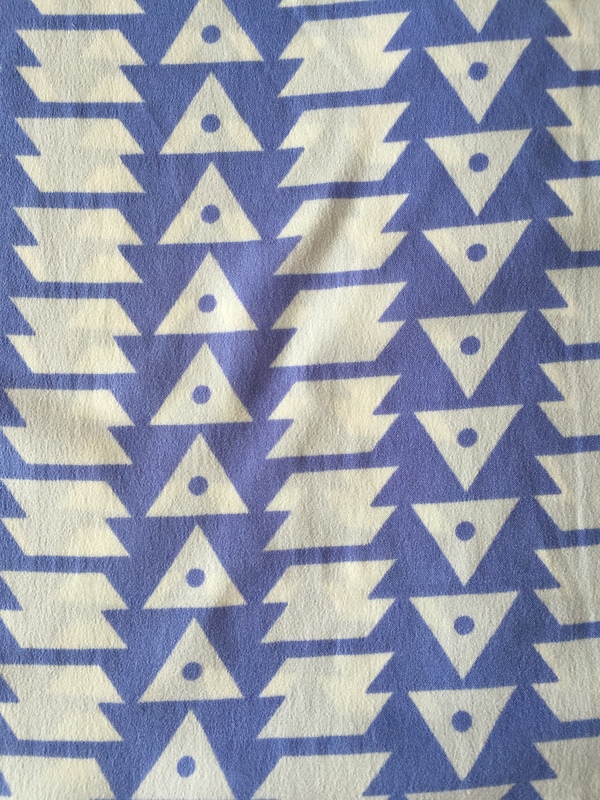 I decided to move away from florals and picked up this cool purply blue and white print. The material is a lightweight polyester, easy to wash and always retains its shape. I love wearing these with skinny jeans in the evening or teaming up with shorts in the daytime. I think this one would also look cute with a fluffy cream cardigan for when it gets a bit chilly. This style of shorts has been around now for about 3 years in Primark. I tend to chose a size up in these only because on occasion they do shrink in the wash, so ideally you should hand wash them. I also don’t want them to be overly tight as I’m going to Mexico where it’s roasting hot! These shorts are the perfect length. 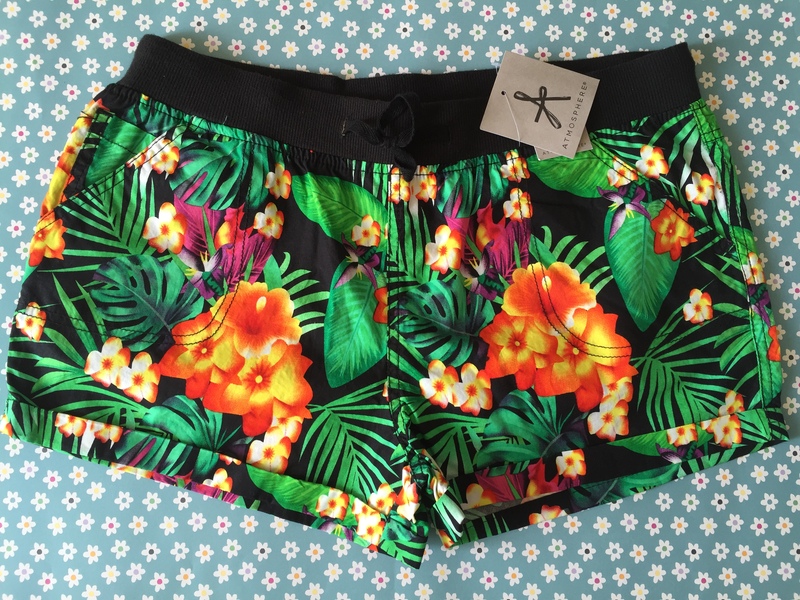 I’m glad that they keep coming back as a lot of the shorts instore seem to be overly skimpy and VERY short. These ones that I picked up have a black cotton elasticated waist with a tie. They are 100% cotton and dry very easily. They retain their shape and have two pockets on the front and the back. I really liked this pattern as it’s different and just looks fun. I’d probably wear these with a white vest and gold sandals. I think bikini’s in Primark can be hit or miss. 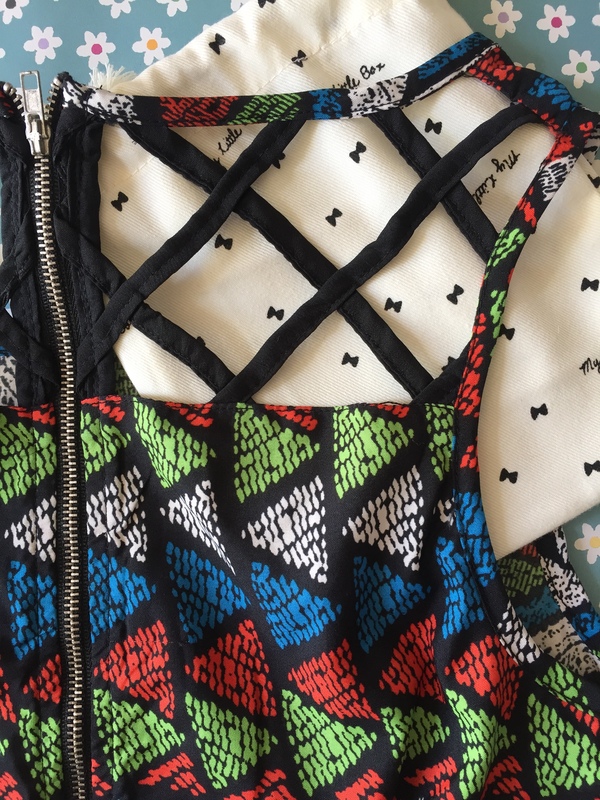 I like the fact that on some designs you can buy the top and bottoms separately. My main reason behind this is because when on holiday in Mexico, for example, it can be rather humid so it takes longer for your bikini to dry eg the following day from wearing it. I don’t mind if the top is slightly damp but I prefer to have dry bottoms. Plus it’s so hot there I like to change multiple times. I know, I’m crazy haha. I thought these were really cute. I prefer bottoms with no ties or frilly bits on the sides. I’m very pale skinned and it’s not a good look if you get sun tan or sunburn marks of where bows etc have been. So I stick to ones which basically look like pants. I think this is adorable. 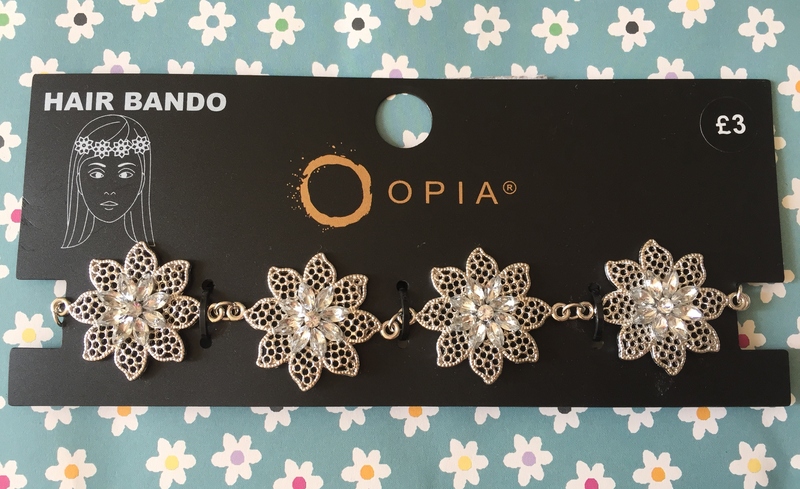 The flowers are silver metal with little jewels in the middle. There are 6 flowers in total which are attached to a black elastic. I actually didn’t realise that this should sit on your head, I thought it was more like a hair band. However I’m going to wear it as a hair band with a side ponytail. It’s easy to shorten the elastic should it end up being too big. This would also look great if you are going to any Summer weddings. I picked a lot of tights! I find Primark tights and pop socks to be the best and also for the best value for money. For example, a box of 5 sets of ankle high pop socks are only £1.50. Bargain! I also picked up these fashion tights which are a 20 denier and feature little black hearts all over them. Perfect for the office wearing with a pencil skirt and it’s something different from the usual black or skin coloured tights. This is the best value for money! 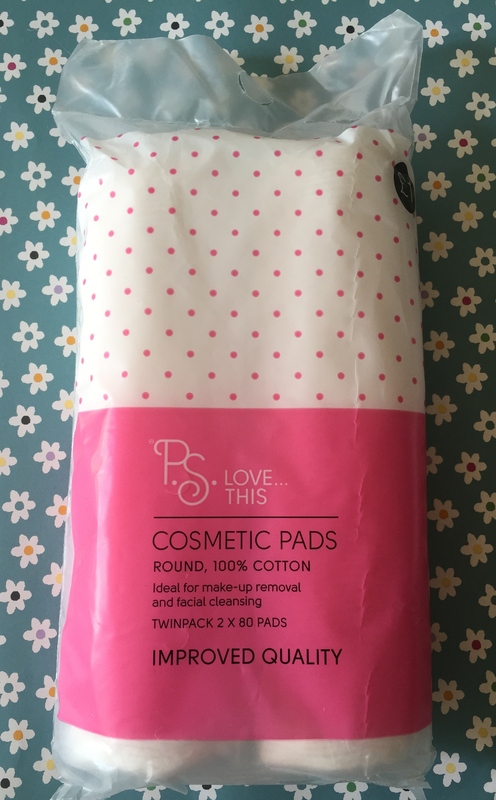 160 cotton wool round pads for £1. Cotton wool is cotton wool no matter where you go so I don’t see why you would choose to spend a lot of money on this item. I use these everyday to remove make up and they’re just brilliant! 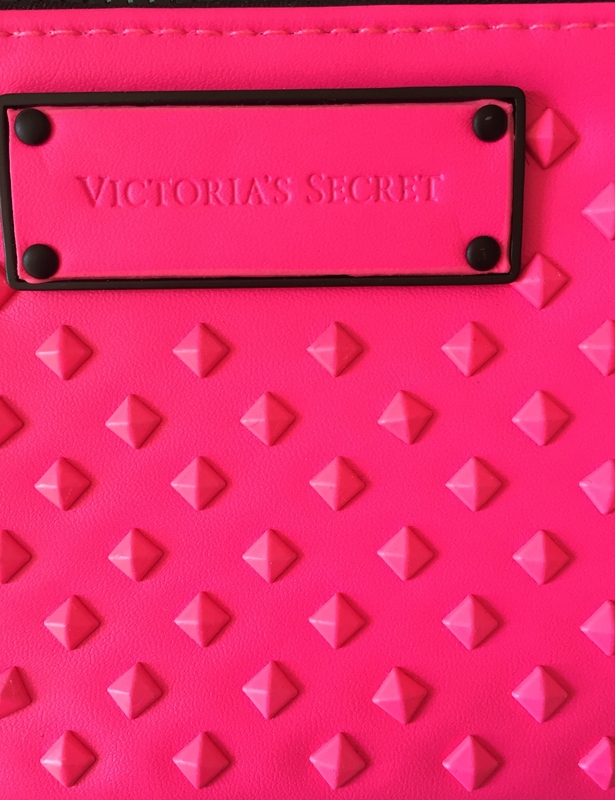 I also popped into Victoria’s Secret and came across this gorgeous purse! I picked up the fluro pink however it does come in a pale yellow and black. 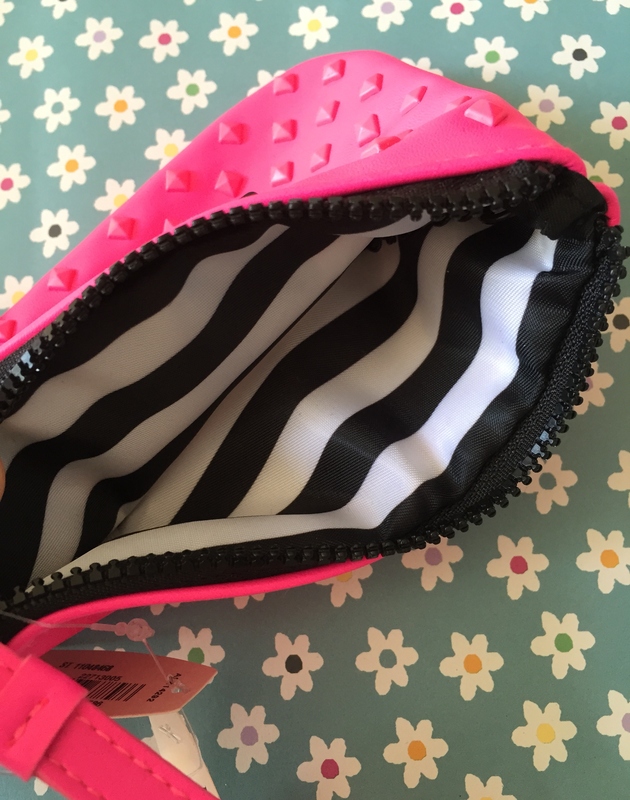 I love anything with studs so this was a winner right from the start! It has a zipped top with wrist strap. 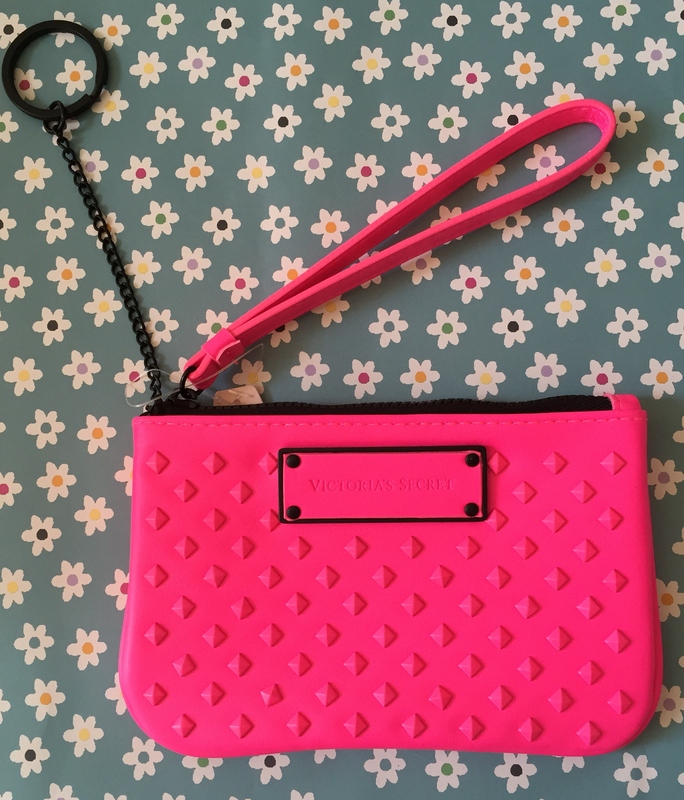 It also has a key attached with a keyring so that you can add in your keys should you wish to keep everything together. The inside is black and white stripes which I love the contrast between the main colour. It’s a very soft faux leather. Victoria’s Secret and their sister brand Pink always have a wide variety of briefs in different styles eg bikini, thong, hipster and a great selection of colours and designs. They are £5 each however you save £5 if you buy in bulk. I hope you guys like this post. Please let me know your thoughts. Have a great weekend! 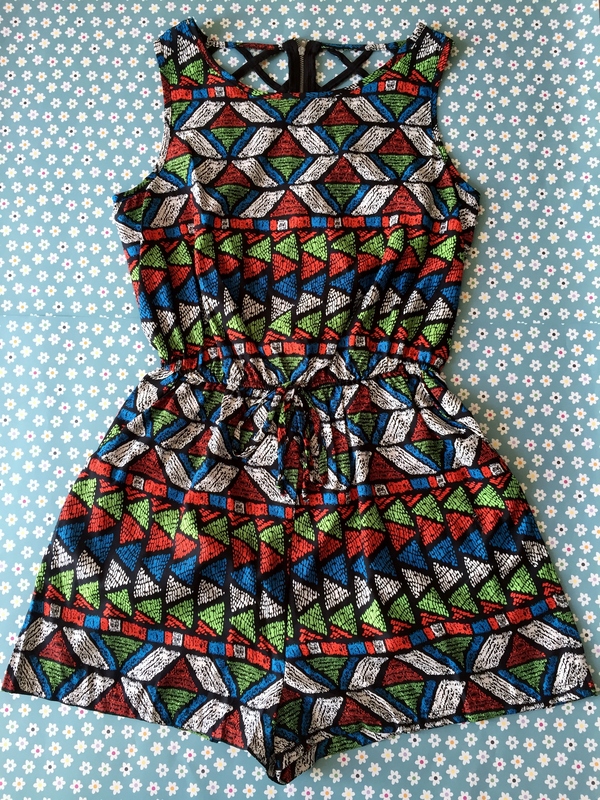 Bandeau playsuit looks so fun and the cutouts on the other dress are so flirty. Love it! The patterns on these pieces are SO much fun! I love them all!